The free Personal Resilience Assessment pdf is available to download at the end of this page. There’s some context you ought to know, and some other free resources. How can you test your resilience without experiencing some unpleasant event? How can you progress without feedback? The Resilience Handbook is designed to solve these problems. All parts of the wheel are connected in real life, and so they must be in a resilient person. The essence of a Resilience Plan is that everything you need to survive and thrive is linked together. Specialising in one direction needs to be balanced by competence in all the others, at both individual and community levels. You could earn your living as an energy consultant, know everything about renewables, but not be able to sharpen an axe. You could be a key responder in a national emergency, know the plans off by heart, but not recognise a carrot plant. It’s not enough to rely on other people to fill in the gaps in your knowledge. You need to motivate yourself to find out more. 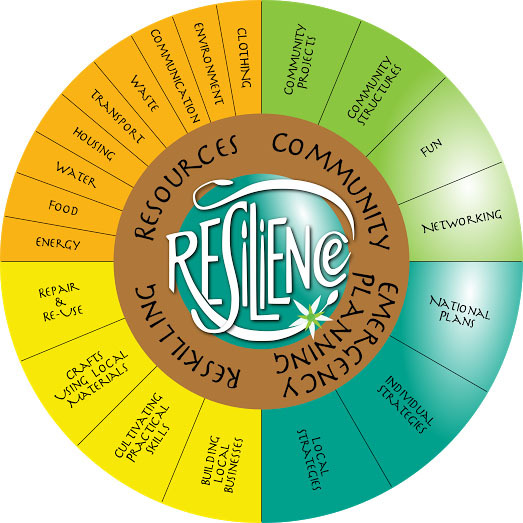 Use the Handbook and the Resilience Wheel to design and follow your own resilience plan. You can chart your progress, test yourself with adventures, join up with others, or work alone. Support materials will be made available along the way. You really need the Handbook to use them properly. For teaching materials – lesson plans, schemes of work etc – lectures and workshops, please contact the author. Here’s a PDF with a brief guide on how to begin, and an outline copy of the Resilience Wheel to print. For the very keen – I’ve revised the draft assessment which was up here for feedback before the Handbook came out, and here’s the new PDF below. Print it out, as you’ll be using it to design your first year’s Resilience Plan. Do the assessment – it’s best to take your time and make notes – then add up your score as described. Set targets for your resilience plan. Which areas of the Wheel do you need to work on most? Whether you coloured in a Resilience Wheel to give a visual recording of your present resilience, or measured your percentage with the Assessment tool, the next step is to design your own plan. This PDF tells you how.